This pack is hitting the road and headed your way. The University of New Mexico Alumni Association, Lobo Athletics and Lobo Club are joining forces to provide a pregame experience for all Lobos and football fans in Las Cruces, New Jersey, Dallas and Hawaii. Saturday, Sept. 10: Lobos take on New Mexico State University at Aggie Memorial Stadium in Las Cruces. Tailgate starts at 3:30 p.m. with a menu including sausage, pulled pork, sides, chips and salsa and non-alcoholic beverages. Kick off is at 6 p.m.
Saturday, Sept. 17: Lobos take on Rutgers University at High Point Solutions Stadium in New Jersey. Tailgate starts at 10 a.m. Breakfast items and a cash bar will be available. Kick off is at noon. Saturday, Oct. 15: Lobos go up against Air Force at Cotton Bowl Stadium at Fair Park. Tailgate starts at two hours before kick off. A cash bar will be available. Kick off time will be announced soon. Each game ticket will also provide entry to the Texas State Fair for the day. Saturday, Oct. 29: Lobos take on the Hawaii Rainbow Warriors at Aloha Stadium. Tailgate starts at 4 p.m. Appetizers and a cash bar will be available. Kick off is at 6 p.m.
Tailgate admission is $10 each. 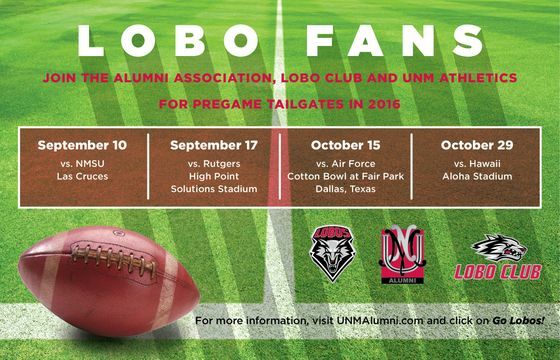 For additional information on each game and to RSVP, visit the UNM Alumni website or call 505-277-5808.